Posted on October 28, 2015 by staceyanderton1	in News and tagged #PressConference, #SuperintendentMichaelHealey. Superintendent Michael Healey took time out of his busy schedule to attend a press conference with the Panther Press staff. On Tuesday Oct. 19, The Panther Press staff invited Mr. Michael J. Healey, PENNCREST school district’s new superintendent, to a press conference in Mrs.Hetrick`s room. The staff’s intention was to ask an array of questions which would help our audience learn about the personal and professional goals of the district’s new leader. 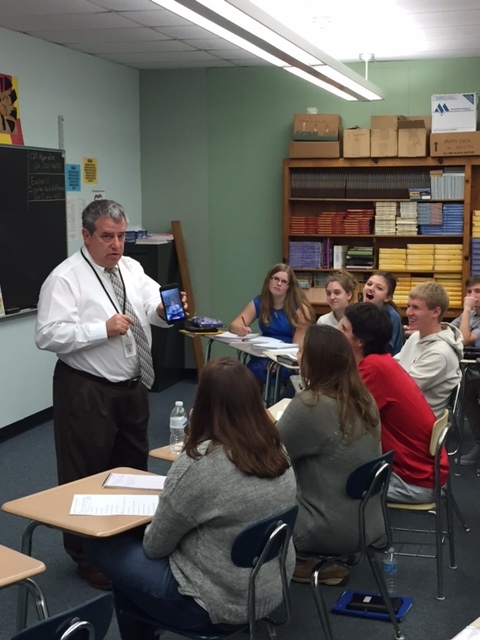 Mr. Healey provided entertaining answers to many questions which helped us better understand his personality. Among other things, he told us that he enjoys reading, fishing, woodworking, and eating. In fact, Mr. Healey has dined with the likes of musician Harry Chapin and members of the band KISS. As a result of the conference, The Panther Press staff now has a more in-depth knowledge of Mr. Healey on both a personal and professional level, and you can read more about him in our print issue which will be released on Nov. 20.